Walt Disney created some of the most popular characters of all time. Here are some of the games available through Amazon.com or their partners. If you wish to purchase any of these items, click on either the title or the picture to be directed to Amazon.com. Platform: Cars takes the high-speed and fast adventure of the cast of Cars to another level. Race to the finish line as you live all the excitement of the next Walt Disney Pictures and Pixar hit! Play as all your favourite characters as you help Lightening McQueen capture the coveted Piston Cup Championship. For more toys featuring Lightning McQueen, Tow Mater, and the rest of the gang from Radiator Springs, go to the Disney Cars Page. Platform: Ratatouille is based on the Disney/Pixar film and brings the fun and laughs of the movie to your Nintendo GameCube. Ratatouille features an acrobatic rat named Remy who must balance his love for cooking with loyalty to his family. Features major voice talent from the film. Relive the movie's best action scenes through the eyes of Remy and Emile. Smell your way through each adventure using Scent-a-Vision. Five different action-packed worlds to explore. Over 20 challenging missions and mini-games. Go head-to-head with multiplayer games. Platform: Disney's Meet the Robinsons is great time-traveling action & adventure, based on the Walt Disney Pictures animated film. Become Wilbur Robinson, the brilliant inventor whose time machine has been stolen. Chase the dastardly Bowler Hat Guy and his diabolical robotic hat Doris through multiple timelines to thwart their evil plans. This game expands the Robinson world and offers an all-new adventure. Wilbur will have a host of gadgets at his disposal as he battles enemies and solves puzzles while pursuing Bowler Hat Guy and trying not to alter the future. Platform: A new video game hero has emerged. Live the hair-raising adventures of Chicken Little and his friends Fish-Out-Of-Water, Abby Mallard and Runt-of-the-Litter. Use your imagination to get out of sticky situations like alien invasions, spiraling asteroids and corn field mazes. Collect and master an arsenal of gadgets including bottle rocket jet packs, slingshots, catapults and a trick yo-yo. Platform: The battle for Narnia begins. Live the epic adventure while playing all four heroes. Battle the evil forces of the White Witch by waging war against a huge variety of creatures, including minotaurs, cyclopes, werewolves and more. Utilize the unique combat skills, weaponry and special moves of each character to fight hordes of dark mythical beasts, or solve intricate puzzles. Platform: Disney�s Hide & Sneak is a platform-style game that blends action and stealth gameplay elements to create an exciting adventure featuring Mickey and Minnie Mouse. Play as Mickey and rescue Minnie from mysterious flying creatures. You will need to solve puzzles, run, jump, dodge and hide from enemies. Control Mickey as he hangs on to ropes, climbs onto containers and uses stealth maneuevers to evade foes. Two Playable Characters - users can play as either Mickey or Minnie. Three unique gaming environment stages - Warehouse, Museum, and Ruins! Master the "Trick" button - unleash special tricks and combinations. More than 30 animated sequences for both Mickey and Minnie to "hide and sneak." 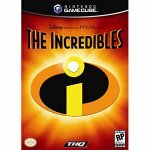 Platform: The Incredibles videogame features intense superhero action and adventure combined with the unique graphical style and humor. The Incredibles tells the story of a family of undercover superheroes who are trying to live a quiet, suburban life, but are forced back into action in order to save the world. Platform: Join Winnie the Pooh and his friends on five birthday-themed adventures. Play all of the most famous Pooh characters: Tigger, Piglet, Eeyore, and Winnie the Pooh. Collect as many honey pots as you can, but beware of the mischievous Heffalumps and Woozles, who still steal honey. whter it's finding a new house for Eeyore or helping Tigger out of a sticky situation, you'll have more fun than ever with Pooh bear and all his friends in their rumbly tumbly adventures in the hundred acre wood. Play all four of the most famous Pooh characters, each with a unique style of play and seperate birthday storylines. Explore five different-looking Hundred Acre Wood environments with all sorts of discoverable objects. Collect honey pots to feed the bees and avoid the fast-moving Heffalumps and Woozles in gameplay that is specifically designed to be fun for younger children. Help Pooh celebrate the birthdays of each of his friends by using the special skills of each playable character, such as Piglet's scary face mode or Tigger's special jump. With many fun-filled adventures in the Hundred Acre Wood, Winnie the Pooh: Rumbly Tumbly is the perfect game for the younger player in the family. Platform: It's just like an animated feature starring Mickey, only you get to control the mouse himself. Here's the story: One night, a mischievous ghost traps a sleepwalking Mickey Mouse in a magical mirror. Stuck in an alternate universe that strangely resembles his own house, Mickey yearns to get back through the mirror. Returning won't be easy, though--Mickey must first recover the broken mirror pieces that have been strewn about his house by the prankish poltergeist. The simple yet elegant gameplay mechanics are accessible to younger gamers. You control a glove, pointing and clicking to guide Mickey to his next destination. Just as in an authentic Mickey cartoon, you will have to outwit enemies and pull gags. You will also be able to uncover special souvenirs, such as Pluto's collar or Minnie's bow, which are all displayed in Mickey's room at the end of the game. Mickey is highly expressive, reacting emotionally to what you do and what he encounters. He may express curiosity, get mad, fall down, run away, or stand his ground. Mickey can receive extra help if you connect with Disney's Magical Quest Starring Mickey and Minnie for Game Boy Advance using the special GameCube/Game Boy Advance cable. A parent mode allows an adult and child to play along together, with the adult controlling Mickey. Platform: Enter the sci-fi world of Disney's PK, the superhero alter-ego of Donald Duck. Zoom into comic book worlds, conquer Ducklair Tower, Area 52, the Evronian Battleship and more through 11 supercharged sci-fi levels. Zap away with cyber-tech weapons and hardware. Power up PK's arm mounted weapon with jet propulsors, lasers, heat-target missiles, shockwave bombs, flame rings and other hi-tech hardware. Thrash wicked alien invaders. Take on Zondag, Zotnam, and a legion of Evronian soldiers - the fiercest villains this duck's ever faced! Platform: Skate like a pro, Disney style! Disney's Extreme Skate Adventure is the first skateboarding game that allows you to skate through the universes of Disney/Pixar's Toy Story, Disney's The Lion King, and Disney's Tarzan. You can create your own skater or play as your favorite Disney characters, such as Buzz Lightyear and Woody from Toy Story, Simba and Rafiki from The Lion King, and Young Tarzan and Terk from Tarzan. You'll get to play through a skating 'career' and perfect your skateboarding skills along the way! Disney locations: enter the worlds of Disney/Pixar's Toy Story 2, Disney's The Lion King and Disney's Tarzan, as you skate and solve puzzles in all the exciting places you've seen in the movies: Pride Rock, Tarzan's Treehouse, Pizza Planet, and more! Create-A-Skater: Design your own game character and learn to skate like a pro. The Create-A-Skater can skate throughout a real world hub area where he or she can interact with real world elements, such as stores, people, automobiles and more! Then, as your character's imagination takes over, he or she will be magically transported in the colorful worlds of Toy Story, The Lion King, and Tarzan for out-of-this world skating adventures! Disney characters: For the first time ever, skate as 12 different characters from Disney and Disney/Pixar's Toy Story 2, Disney's The Lion King and Disney's Tarzan, such as Buzz Lightyear, Woody, Simba, Pumba & Timon, and Young Tarzan. Plus, 15 non-playable Disney and Disney/Pixar friends and foes will interact with you throughout your adventure. Pro moves: Skate like the best, incorporating sweet tricks like ollies, rail grinds, spins and other expert balance moves. Try your stuff on skateboards, Victorian mirrors, frying pans and other cool foot rides. Perform your cool skate moves on any of the surfaces in each world, such as grinding on dominoes in Andy's Room, spinning your board as you jump off trees in the jungle from Tarzan, and ollieing over bones in the Elephant Graveyard from The Lion King. Multiple modes: Practice tricks and explore levels in Free Skate Mode, complete goals against the clock in Adventure Mode, and compete against friends in split-screen Two Player Mode. Multiple control modes make it fun for everyone. Platform: Welcome to Disney�s Party! Join a cast of your favorite Disney characters at Uncle Scrooge�s fun-filled party. Playing as one of six Disney characters, you�ll enjoy many fun games and mini-games, and tons of fantastic surprises and prizes. With a variety of ways to play and many different and amusing places to visit in Party Park, this adventure is truly amazing. So, what are you waiting for? Get ready to join Tinkerbell as she guides you through the park of a lifetime! Compete against up to four friends in 30 exciting mini-games including "Old Town Shoot Out" and "Defeat Da� Pirates." Play as your favorite Disney characters, including Mickey, Minnie, Donald, Daisy, and Goofy. Find fun and adventure in 14 different worlds�each with its own unique theme such as Nature Island or Future Town. Experience four challenging game modes like Mini-Game and Play in Pairs mode. Discover over 230 collectible Character Cards featuring your favorite Disney friends. Platform: In Haunted Mansion, you've found the house of your dreams -- now you have to remove the spirits that are turning it into a nightmare! Zeke Halloway has found trouble in his new home - it's furnished with wall-to-wall ghosts! Now he's got to get rid of the spirits before they scare him to death -- literally! Fight to rid the Haunted Mansion of its 999 trapped souls, or else you'll become one If you get scared to death, you'll become a ghost and fly through the Mansion, for a new level of gameplay. Solve unique puzzles to free each spirit, and interrogate them to learn what you need to get some peace in your new home! Kids will have fun cooking for Pooh and friends -- they'll tell you how much they like it! Platform: Make them laugh! Having learned power of laughter, the monsters of Monstropolis have created a new training game to help them practice making kids laugh. Throw, dodge, and block your way to victory and be the first to knock your opponents silly! Platform: Mickey and his pals turn football upside down! Get ready for some serious game with explosive tackles and spectacular touchdowns as Mickey, Goofy and other Disney favorites take to the gridiron. With pick-up-and-play controls and the unique combination of Disney fun and football action, this game is perfect for players of all ages. Platform: Disney Sports Soccer takes the fun of a neighborhood soccer game and adds the excitement of Disney-style competition. Seven distinctive game modes, as well as a multi-player mode create the perfect soccer experience. Use exciting magic moves and exchange items between your Game Boy Advance and Nintendo GameCube. Platform: Mickey and his pals are holding court! Are you ready for some of the fastest-paced, highest-flying, hardest-slamming basketball action you've ever seen? Disney Sports Basketball brings exaggerated moves and original locations to life as your favorite Disney characters take to the court. Donald Duck : Goin' Quackers! Platform: Daisy, a TV journalist, has gone to Merlock's castle for an unannounced interview. Merlock doesn't appreciate Daisy's in-your-face interview tactics and holds her hostage while he comes up with a plan to take over the world. So it's up to Donald Duck to rescue Daisy in Goin' Quackers. The game gives players instructions as they progress through the levels. When you come to something new, Donald's nephews explain what's going on. While not having to read an instruction book is nice, the game explains so many simple concepts from the beginning that this feature hinders more than it helps. For instance, gift boxes contain power-ups. Power-ups are good. You should get them. The quality of the game's graphics varies greatly throughout. For example, some of the buildings show great detail, while in another area it can be difficult to tell whether you're facing a cliff or a thorny plant. Also, while Donald is superbly animated, the game's many textures look grainy compared to those of other PS2 titles. The sound, on the other hand, is spot on. The sound effects are pleasantly cartoonlike, even though the voices are annoying, especially Donald's. Experienced gamers will blow through this one, assuming they want to, but younger gamers will find the game sufficiently challenging and fun. Gamers young and old, however, will agree that there's nothing to like about Donald's new voice.